Ureteric calculi (or) stones that obstruct a patient’s ureter originates in his kidney. 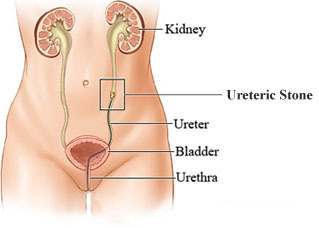 They are usually painless while they remain in the kidney, but they cause severe pain when small pieces leave the kidney and travel through the narrow tubes (ureters) to the bladder. Between 5-12% of the whole population may have a ureteric stone during their lifetime, and the recurrence rates approach is 50%. The quality and the location of the pain is depends on the calculi’s location within the ureter. Up to 80% of the renal calculi are formed by calcium stones. While up to 20% of cases present with uric acid, cystine and struvite stones. Family history, low fluid intake, frequent urinary tract infections and medications that my crystalise the urine are the major causes of the ureteric stones. Ureteral stones include pain in the upper back, upper abdomen or high on the side of the abdomen, the pain may spread to the lower abdomen and genital area. Visible blood in the urine or microscopic (non-visible) blood in the urine. Patients with ureteric calculus may suffer with peristaltic pain, nausea and vomiting with stomach pain, painful (or) frequent urination (dysuria). In addition to the routine history and clinical examination, investigations was carried out for the patients with suspected ureteric colic including intravenous urography, computed tomography plain abdominal radiography and ultrasound. Most of the patients suffering with acute renal colic due to ureteric calculi and can be manage conventionally with hydration and analgesia until the calculi passes. Hospitalization may be required where oral analgesia is insufficient. Calculi (or) stone size and location as well as ureter structure are main factors in determining likelihood of spontaneous calculi passage, with stones which are less than 5mm will pass down the ureter. Once the calculus is passed it should be retained and sent for the analysis to evaluate for possible underlying causes of stone disease and better plan for prevention.